During the Cairns Giant Black Marlin Season from September to December Motherships can be chartered along with the game fishing boat providing anglers with affordable 5 star service, high standard of luxury accommodation and restaurant grade meals after a day’s fishing. Besides luxury and comfort motherships are readily available to move along the inside of the fishing grounds to where the fishing action may be. The mothership anchors behind the reef during the day while the anglers are on the fishing grounds each day. After a long days fishing what better way to end the day, then to enjoy the comforts and service provided by these motherships. The Iona II likes to utilise the Phoenix One for our clients during the Cairns Giant Black Marlin Season as it offers our guests optimum luxury hotel style accommodation while still being on the ocean. The Phoenix One is a 114ft luxury motor yacht. The vessel features two VIP staterooms, a spacious double & twin cabin all with ensuites. 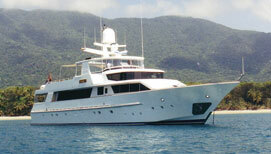 The vessel can accommodate 8 guests in luxury overnight. For those who choose to stay aboard the mothership while other passengers are out fishing the reefs for the giant black marlin there is the opportunity to participate in water sports activities like jet skiing, water biscuits & ocean kayaks or you may just want to sit back & relax in the heated spa on deck & take in the beauty of the Great Barrier Reef surrounds. Contact us for mothership options and pricing.